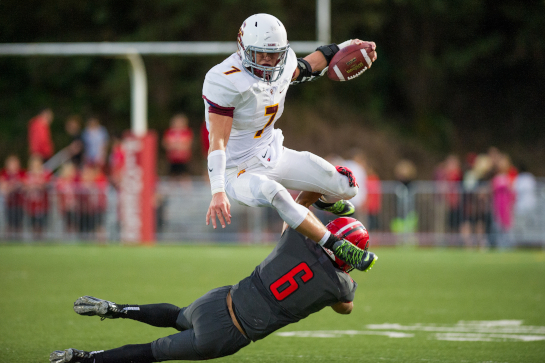 After four quarters of play the Oregon City Pioneers and the Central Catholic Rams were deadlocked at 14-14. In the two overtime periods each team scored touchdowns on improbable fourth down passes to the endzone. 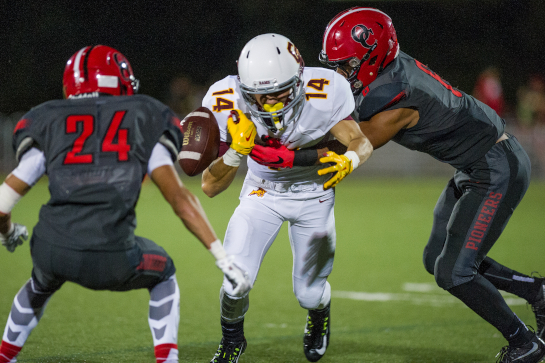 In the second overtime, the situation for the Pioneers looked hopeless with lost yardage plays setting them back on the 33 yard line on fourth down and having to make it into the endzone sitting fourth-and-thirty-three. 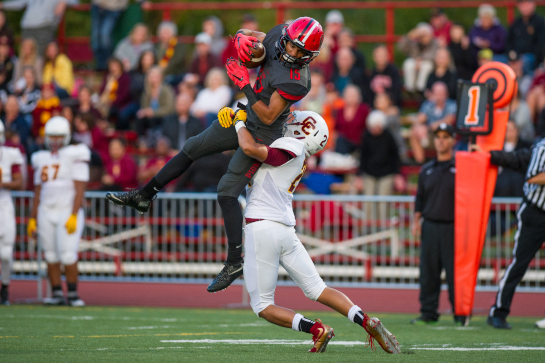 Oregon City quarterback Dequahn Dennis-Lee threw a Hail Mary pass and somehow wide receiver Trevon Bradford pulled it down under heavy coverage for the touchdown. Needing only an extra point fieldgoal to tie the game and force a third overtime, the Pioneers bobbled the snap and kicker Jordon Phillips never got a chance to kick as the Rams smothered the loose ball to end the game with at 21-20 victory at Oregon City Pioneer Stadium. 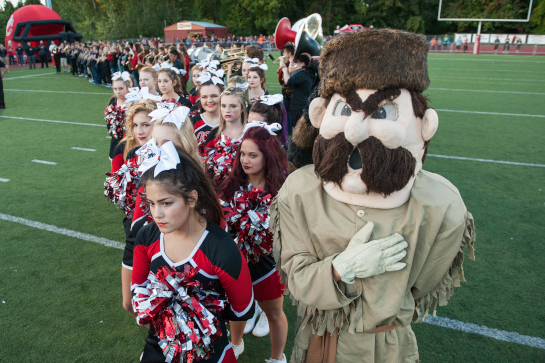 Oregon City vs Central Catholic OSAA 6A Football - Pioneer Stadium, Oregon City, Oregon - Oregon City mascot and cheerleaders during the playing of The National Anthem. 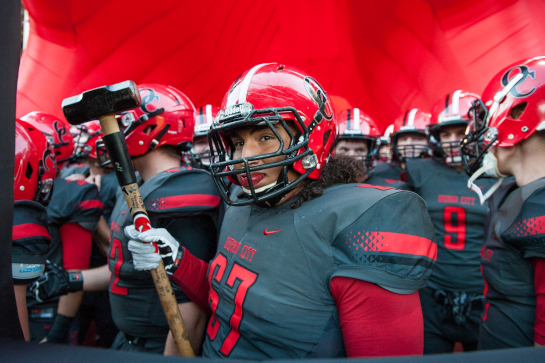 Oregon City vs Central Catholic OSAA 6A Football - Pioneer Stadium, Oregon City, Oregon - Oregon City lineman Nic Illa (67) holds the Pioneers' symbolic sledgehammer in the tunnel. 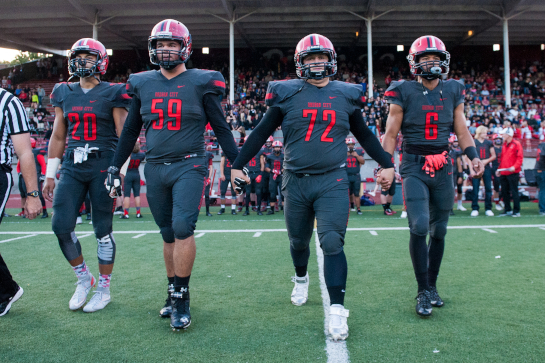 Oregon City vs Central Catholic OSAA 6A Football - Pioneer Stadium, Oregon City, Oregon - Oregon City captains Kiahve Dennis-Lee (20), Aaron Parker (59), Duncan Cranston (72) and Trevon Bradford (6). Oregon City vs Central Catholic OSAA 6A Football - Pioneer Stadium, Oregon City, Oregon - Oregon City defensive back Trevon Bradford (6) forces Central Catholic wide receiver Jack Vecchi (14) to fumble the ball as Rieker Daniel (24) recovers for the Pioneers on their own 47 yard line 4:23 left in the third quarter. 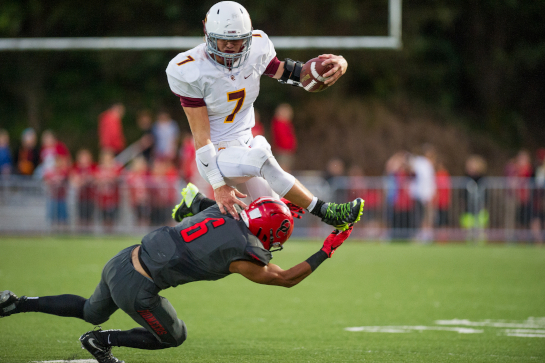 Oregon City vs Central Catholic OSAA 6A Football - Pioneer Stadium, Oregon City, Oregon - Central Catholic running back Brady Breeze (7) leaps over the tackle attempt by Oregon City defensive back Trevon Bradford. Oregon City vs Central Catholic OSAA 6A Football - Pioneer Stadium, Oregon City, Oregon - Oregon City wide receiver Teron Bradford (15) make a pass completion for a nine yard gain and a first down on the Rams six yard line in the first quarter.